The other day I noticed KC tool was promoting this Gedore wrench for plumbing fittings. I’d never seen anything like it — it has the characteristics of several different tools, like a Pliers Wrench, adjustable wrench, and Vise Grips. 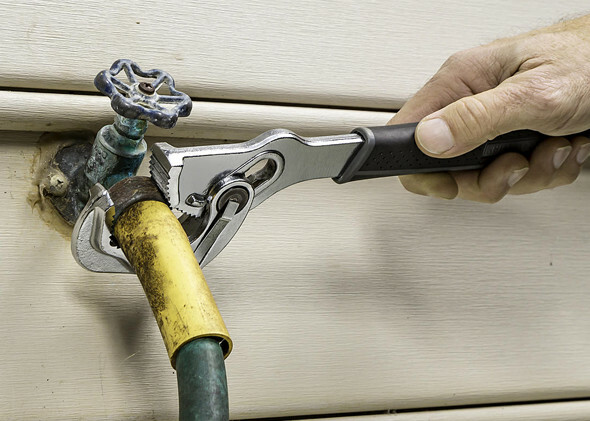 The wrench is made for turning nickel and chrome plated plumbing fittings, and has removable 8mm plastic jaws to protect finished fittings’ delicate surfaces from being marred. The parallel jaws can clamp fittings up to 65 mm (2.5″) wide and 45 mm (1.75″) deep. While opening and closing the jaws, the length of the wrench extends from 250 mm to 299 mm (9.8″ to 11.8″). Made in Germany, the tool is constructed from chrome-vanadium steel (31CrV3) which has been hardened and chrome plated. The locking handle is enameled blue. This wrench is not cheap. The best pricing I could find was Chad’s Toolbox where they charge $97 and have free shipping over $49. As this wrench is imported, KC Tools seems to be out of stock on the Gedore 320000 wrench for now, but if you prefer KC tools and are willing to wait they charge $118 with free shipping. You might want to head over there for a look anyway, because they have a short non-embeddable video showing how the wrench operates. P.S. Don’t forget about our KC Tool coupon code! It’s a good idea, but not for that price. The design makes it look like more than it is. 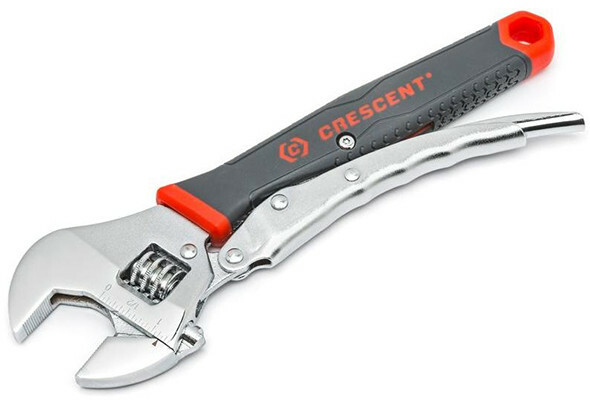 It isn’t dissimilar to this Crescent tool. Although slightly updated the design has been around for a while. I’ve seen several vintage tools from 50’s with similar features. This looks more like a pipe wrench that can grip round pipes and fittings. I can see this being used on the those chrome strainer spouts on bathroom faucets. If they would have put the dynamic handle/grip on the bottom and lowered the price to somewhere near reasonable, I might have considered it. They have made tools similar to this for a long time. In principle, it is like the Knipex pliers-wrench. Parallel jaws, adjustable, but with handles that close the jaws the last bit. Differences: this one has soft jaws, of course, and it looks like the crescent wrench-style, worm-gear adjustment should be slower than Knipex’s press-button-then-slide. And it costs twice as much as a Knipex. For the few times I have had to deal with delicate fixtures, I have wrapped my Knipex jaws with tape. It worked fine. If I had to deal with them daily, I might look at this or other options. Probably other options. Looks a like a modified form of Swedish Pattern pipe wrench or for the Globalists –Bahco calls them “Universal pipe wrench”, but they have incredible bite and are a little more flexible than vise grips imho, far more versatile than just for plumbing. FWIW Amazon has a whole slew of soft Jaw wrenches/pliers if only for the occasional delicate finishs work, starting at HF prices. That wrench is made by Bollmann- grip the largest high volume manufacturer of locking pliers in Germany. They are re-branded for for several other manufacturers including gedore and rothenberger. PS they work great. For all the plumbing jobs I do a pair of Stillsons and a couple of strips of copper is enough. But I do admire the thought that has gone into the tool. Im surprised it doesn’t have Apple logo on it and sold with a slogan that goes something like “The new iPlunge with removable designer polyurethane precious metal handling strips: because your gold plumbing deserves to be fitted by a tool just as overpriced and as useless as golden plumbing pipes”. Never underestimate just how bent out of shape a client can get over something you think isn’t very important to you but is VERY important to them, especially clients that spend money on “premium” materials. When they’re paying for the job to be done right, you better do it right the first time, at least if you have any intention of having a good reputation for workmanship that is. I just bought one of these (new job involving a lot of parts with delicate finishes). I’ll check back in with some feedback once I’ve gotten to use it for a while.